Modineer can design and build your specialized tool or die projects in-house, ensuring that your manufacturing specification are always met with the highest standard of care and quality engineering. We offer this product enhancement service as a part of the Modineer’s initiative to offer an array of value-adding project improvement services. Modineer offers a full-service tool and die shop within a newly renovated 30,000 sq. ft building that is dedicated to tool production. This ensures efficiencies in both design and cost, which is subsequently passed to you reducing. This improved tool and die production process from our Modineer team guarantees that your total program cost is reduced and that lead-times stay on schedule. Modineer is fully staffed with designers, engineers, and program managers that develop your tool from initial CAD mockups. From initial design, our team verifies part geometry using the latest in simulation software. This intensive process allows for the complete tool design to be release for build. Our customers rely on us to provide manufacturing and tooling expertise during the design phase of the component. This is critical to help reduce program costs and overall risk for our customers. When you approve your concept, our team can expedite your build for even further time reduction and quality assurance. Our Program Management provides you with detailed schedules as your tool progresses to keep you constantly involved and aware of your project’s status. Beyond this, we can maintain your tool or die through both resource or takeover efforts throughout the life of your product. Modineer has numerous CNC machines, Blanchard capabilities, wet grinding machines, lathes, EDM wire burners, boring mills, and Bridgeport capabilities. We use this equipment in our tool build, die maintenance, and continuous improvement practices. Using specialized software, we can simulate a part or tool concept to allow our customers to evaluate them prior to entering production. Modineer’s extensive knowledge of processes, material types, and part geometries allows us to look at each process with a critical eye to best achieve the optimal process, efficiency, and cost for each of your parts. As an extension of your engineering department, Modineer will work with you and your project team. Throughout teams’ partnerships, we develop process layouts, as well as provide estimate blank sizes, strip layouts, die size, tonnage calculations, and die costs. This all takes place early in the project process to determine the optimal approach to developing and producing your parts. The detailed reports that we provide allow our customers to align stakeholder interest (OEM/Tier 1, stamping supplier) so that process and cost consensus can be achieved early in the project. 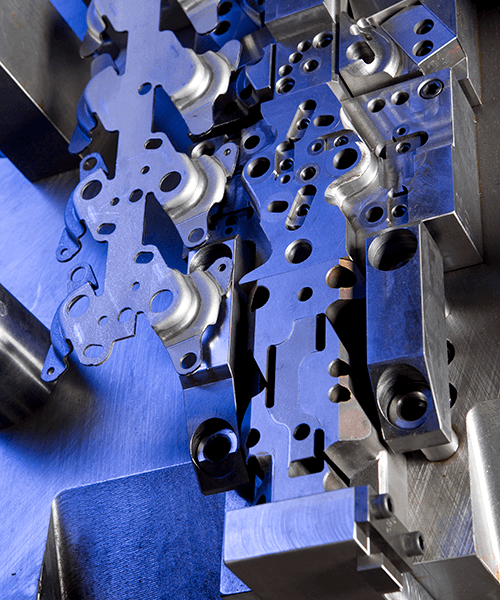 Whether it be progressive, transfer, or tandem die process, Modineer’s engineers have the requisite experience to view the parameters that influence the blank size, part orientation in the die, number of stations required, and press requirements. Beyond these outlined capabilities, Modineer engineers can deliver customized solutions that fit your exact product need. This ensures product quality and customer satisfaction on every project completion.